The concept of Keel Square was developed in collaboration with the landscape team of Sunderland City Council. 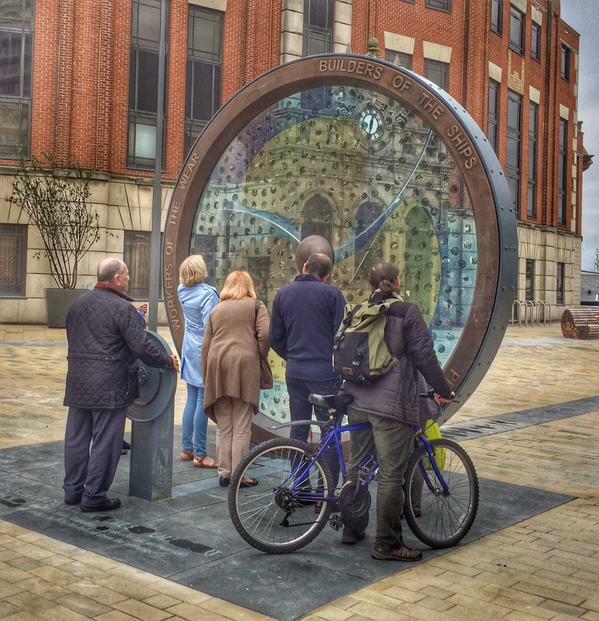 This new city square with it’s integrated artwork honours 600 years of shipbuilding, and the unsung heroes of Sunderland who through the building of ships, built a city. The ‘Propellers of the City’ sculpture sits 292 metres from the cliff edge of the River Wear and its shipyards, which is also the length of the largest ship built on the Wear -The Naess Crusader. A granite keel line listing the thousands of ships names links the propeller sculpture to a ship’s prow structure that is still to be built. 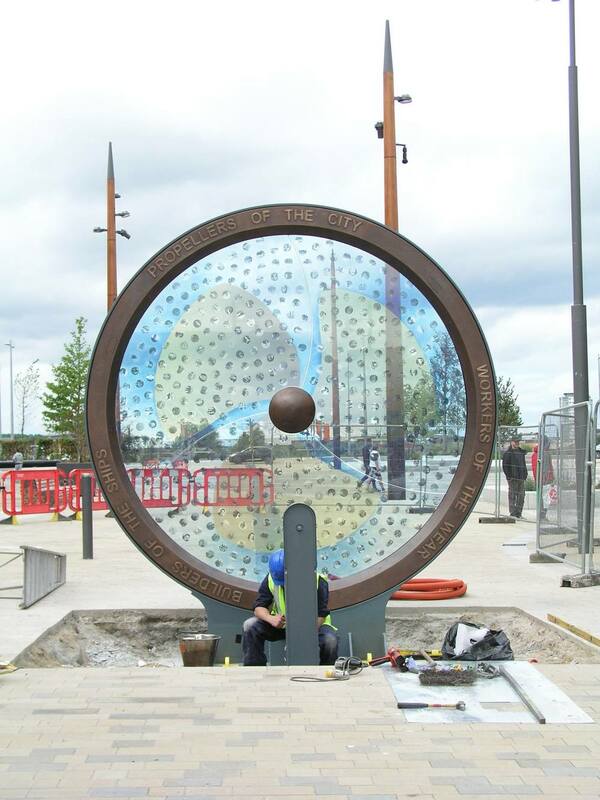 The Keel Line incorporate a series of illustrations recording the history of Sunderland by graphic artist Bryan Talbot. 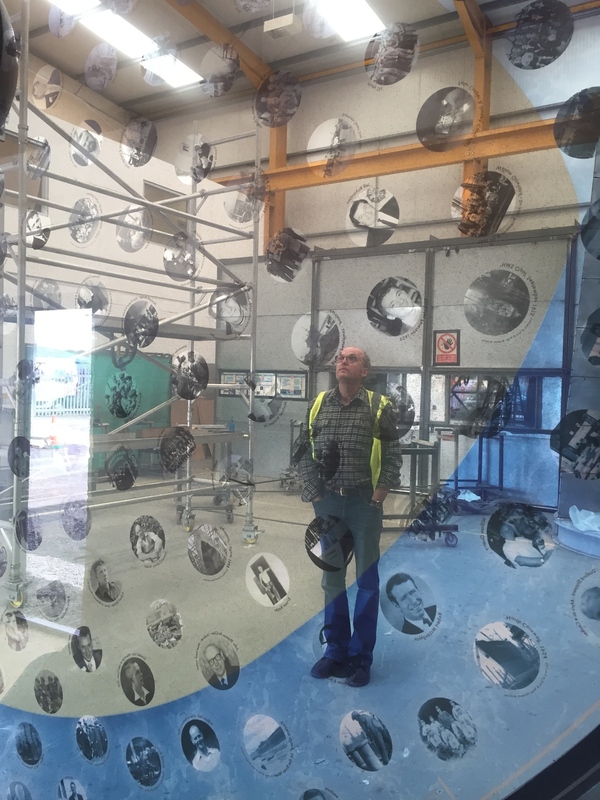 Visitors are able to turn the 3.5m diameter glass and bronze propeller to allow the close inspection of the 500 inlayed shipyard photographs which were all collected through an active engagement process with former shipyard workers and their families. The collecting of shipyard histories will continue through Living History North East (LHNE). We were very inspired by this image from the book Where Ships are Born, Sunderland 1346-1946, A history of Shipbuilding on the River Wear. By J.W Smith and T.S Holden, Published by Thomas Reed and Company Limited, Sunderland 1953. A book has been published that documents the process, and records each face within its co-ordinates on the Propeller. 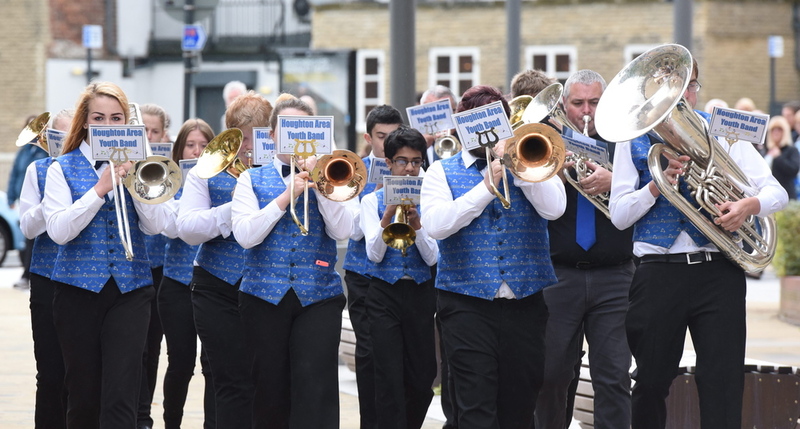 The book was presented at the opening of the square in August 2015 to all the participating families along with an enamelled propeller badge. In 2012 Kevin Johnson, principal landscape architect at Sunderland City Council, asked us at Broadbent Studio to help develop ideas for a new public space on the old Vaux Brewery site. 26 prime acres near Wearmouth Bridge had lain derelict since the infamous asset-stripping and closure of the brewery in 1999. The area had remained a wasteland due to a stand-off between the Council and Tesco, who bought the site in 2001. Feeling that the site with its key location was too important to become simply a supermarket and car park, the Council repeatedly refused Tesco planning permission. Finally, in 2011 the Council managed to buy the land. The Council wanted to see the area become a lively mix of shops and cafés, offices, hotels and flats, with an emphasis on creating jobs. It lacked the money to build all this itself, but with control of the Vaux site came the chance to direct private developers. The Council could itself lead the way by landscaping the site - moving the road and creating attractive outdoor areas. 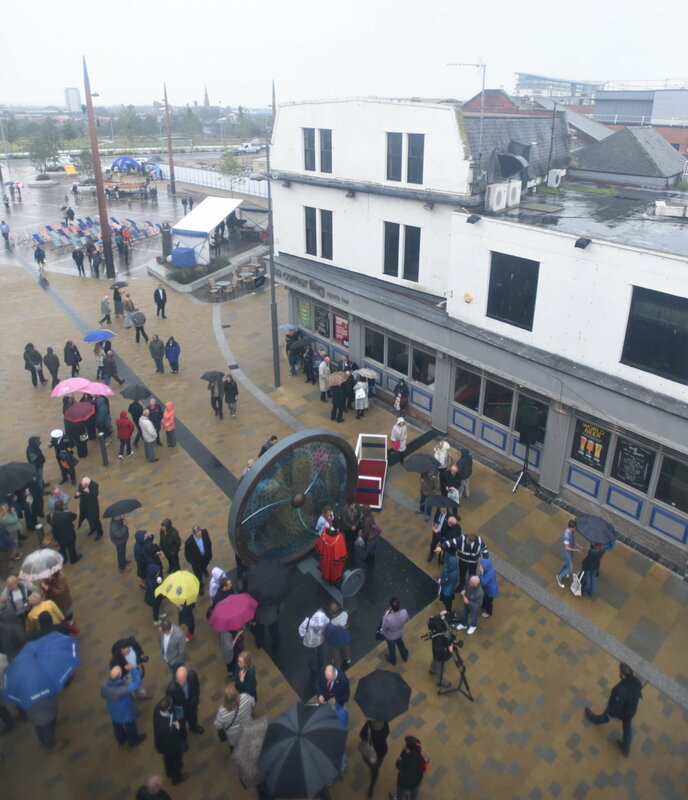 One thing Sunderland lacked was a central civic space - a place for people to meet that said “you have arrived at the city centre.” So before considering any other outdoor areas, the Council’s first thought was to create a main square for Sunderland outside the Magistrates’ Court. This square would have to be impressive, inviting and meet a number of practical requirements, but it would also need to tell a story. If it were to become a living part of Sunderland, a new city square would need to say something about the city and her people. For nearly 170 years Vaux Breweries was a Sunderland institution. Beyond the brewery stood Lambton Drops, and before that the Wear’s very first coal staiths built in 1812. By the 1860s, the nearby Wear Glass Works was producing a third of the country’s sheet glass. Sunderland is not short of stories to tell of great industries served by the river. But one story is bigger than the rest. It was shipbuilding that put Sunderland on the map. Shipbuilding made other industries possible by making the Wear a working river, and the Wear made shipbuilding the greatest industry of all. With it came engineering achievements to match any the world had known - the colossal size of the ships built on the Wear is staggering to contemplate. Yet looking at the river today it is as though none of it ever happened. Who were the people who built these giant ships? Shipyard owners and naval architects certainly, but also draughtsmen and template makers, also shipwrights and blacksmiths, also welders, riveters and sheet metal workers - skilled tradesmen all, most of them prepared to risk their lives every working day. These people built ships and in doing so built a city. But their story has been forgotten. Kevin Johnson was keen to put this right and in meetings with him and his colleague James Gordon we all agreed that a city square and any other public space on the Vaux site would need to speak of shipbuilding. Kevin discovered the distance across the Vaux site was almost exactly the length of the longest ship ever built on the Wear, the 1972 Nordic Crusader. He drew its outline pointing to the river on a map of the site and we pictured it sitting there, its vast hull dwarfing everything in sight. We now saw how the new square could become part of 3 interlinked public spaces laid out to evoke a ship. A wide tree-lined avenue could lead from the square to a lookout point over the river, like a keel linking stern to bow. Flanked by new buildings, the result could be both an appealing group of outdoor areas and a monument to shipbuilding. Running down the centre of an avenue of trees would be a line of granite the length of the Nordic Crusader carved with the names of all the ships ever built on the Wear. It would suggest a keel line laid down in a shipyard and would demonstrate the scale of shipbuilding on Wearside down the centuries. (The Keel Line was eventually illustrated by Sunderland artist Bryan Talbot). The Keel Line would lead to a generous viewing area overlooking the river, designed to look like a ship’s prow. Here there would be a café and exhibition centre, and lifts down to the riverside park and waterfront. 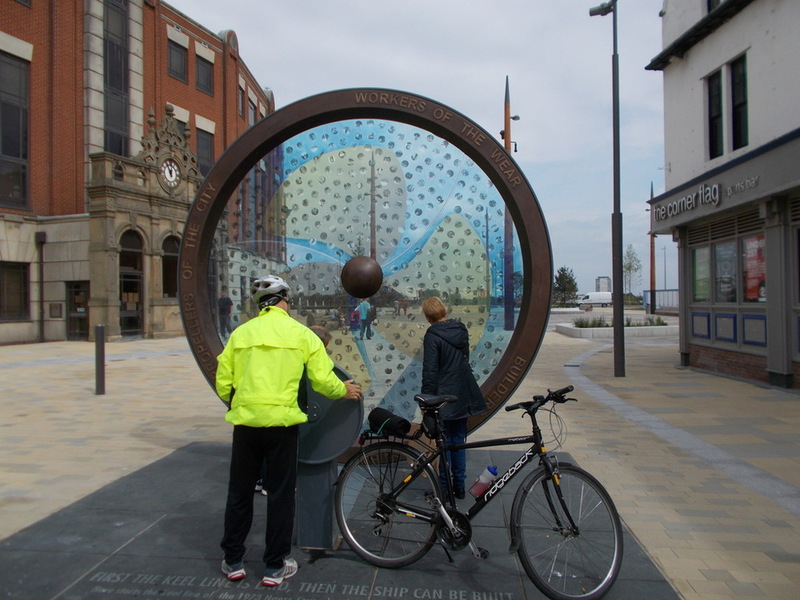 The Keel Line would begin within the city square at the foot of a propeller-shaped sculpture carrying text or imagery of some kind relating to shipyard workers. The propeller would need to turn to give a sense of being the driving power behind the ship, and we hoped to make a connection between the power of a propeller and the power of a workforce. As Sunderland has such a long glass-making history, we first thought of the sculpture as a 3-dimensional propeller cast in coloured glass. But then it came to us that the propeller should carry the faces of shipyard workers. Faces would make the artwork personal and it would be crucial for them to stand out against the propeller. 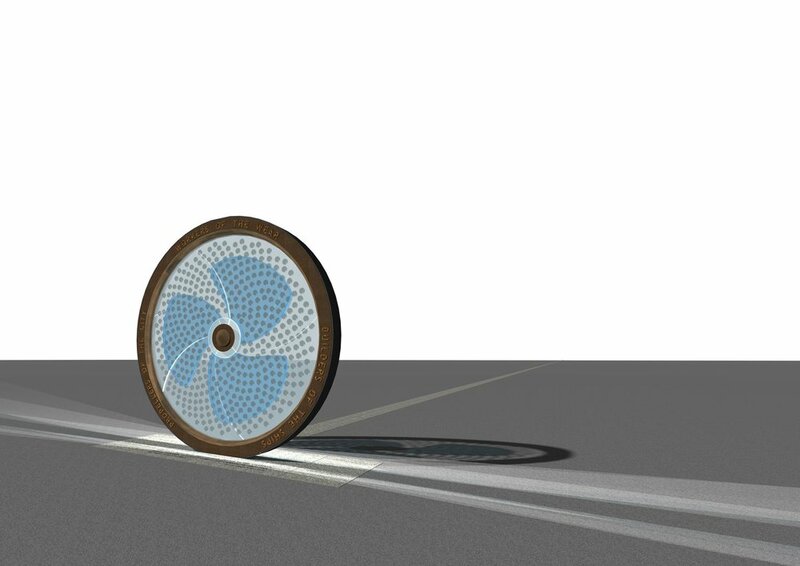 So we opted for a simple outline of a propeller on a flat piece of glass that would allow the faces to be seen as clearly as possible. The faces, a few hundred representing millions, were the real issue. And now, as we imagined people looking for faces they knew, the need for the glass to turn took on a new importance. If people were to come up close to the propeller to study the faces, then we wanted it to turn without an axle getting in the way. This meant setting the glass into a frame able to turn inside an outer ring. Such a frame would need to be wide enough to house substantial bearings and this would give us room for some bold bronze lettering. Picturing a propeller covered with faces, it became obvious what we needed to write. On one side a list of these people’s professions, on the other an acknowledgment of the contribution they and millions like them made to their city. They built ships and ships built Sunderland. 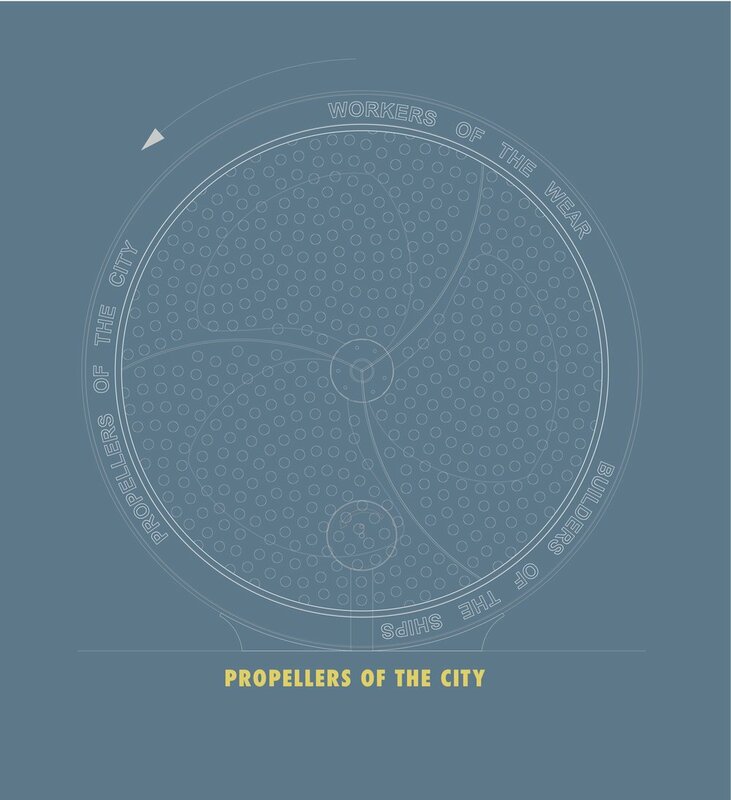 As propellers drive a ship, so shipbuilders drove a city. This was what we needed to write. This was the reason there would be a propeller memorial to them in the city’s main square. Taking Propellers of the City from the drawing board to a finished sculpture took the combined efforts of hundreds of people. Construction got going in Ulverston, where artist-blacksmith Chris Brammall and his team started engineering the turning mechanism and fabricating the frame from bronze and steel. Meanwhile, back in Sunderland the long search for faces began. Through local press and radio, banners at the Airshow, leaflets in the shopping centre, we put out an appeal for people to send in photographs of family members who had worked in the shipyards to Jeanette Hilton at Living History North East. Each photograph was scanned and documented with any information known to build up a permanent archive at Living History, before being returned. Once this was done, Jeanette’s team sent the scanned images to us, where they were repaired as needed, colour adjusted, sharpened and cropped to enhance clarity. 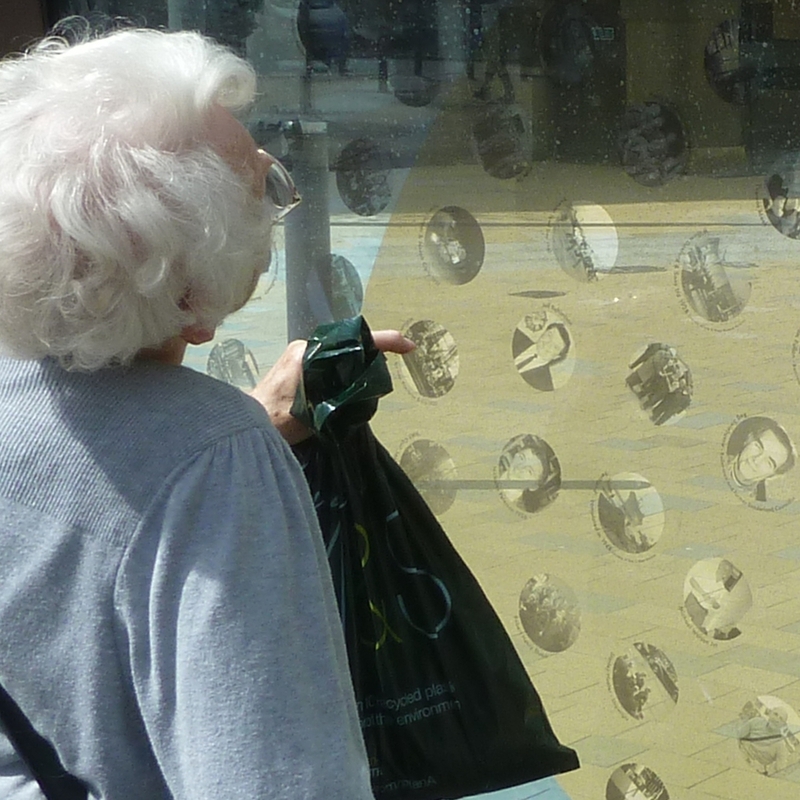 When all the photographs were ready, we incorporated them into our propeller design and had the finished artwork printed onto a transparent film. The printed film was then laminated between 2 sheets of 18mm toughened glass by Romag, a specialist glass manufacturer based in Consett. 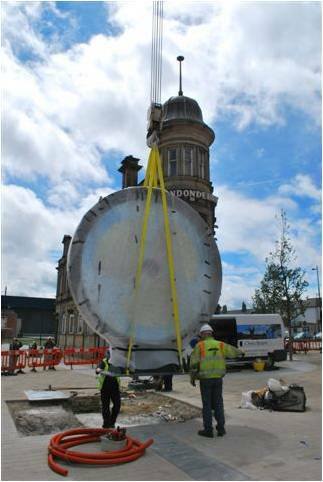 By this time, Brammall’s had finished the metalwork and were able to fit the glass into the frame. But now, with the weight of the glass, the mechanism became hard to turn. It was really important to us that people of all ages would be able to turn Propellers of the City smoothly and easily, so there followed another few weeks’ delay while a lighter gearing system was fitted. 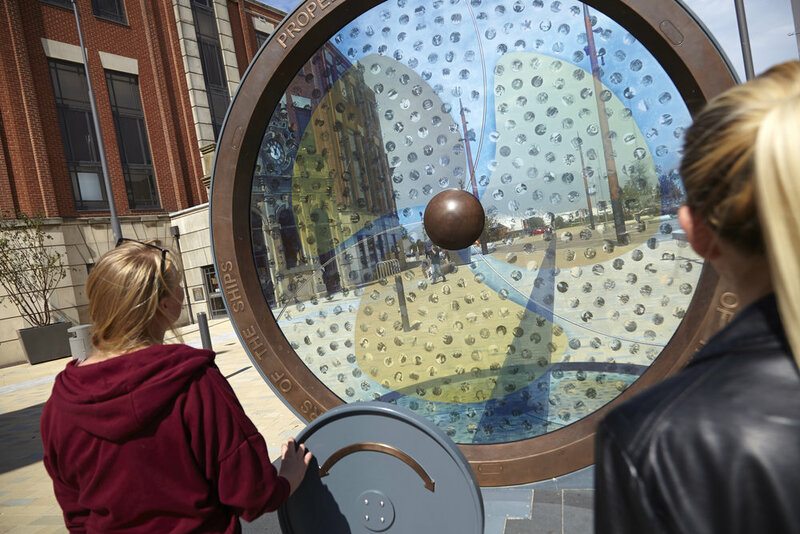 Finally, after two years’ work, a memorial sculpture for Sunderland’s new city square, christened Keel Square following an appeal for a name, was ready to be installed.